Mars casino is a new 2016 online gambling site that accepts Canadian and French players. It is a bitcoin casino and sister brand to the 7Bit casino. Players can wager in bitcoin and regular currencies. 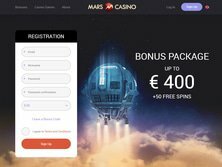 The Mars casino bonus for new players is $400 + 50 free spins and there is no code required. When you sign up for a real player account and make your first deposit you receive a 100% bonus plus 50 free spins. Players also get 25% on their second deposit and a further 50% on their third deposit. The minimum deposit amount is $20/0.05 BTC and the free spins are added in installments of 10 free spins every day from the day after your first deposit. The free spins for regular currency players are on NetEnt's Starburst slot. 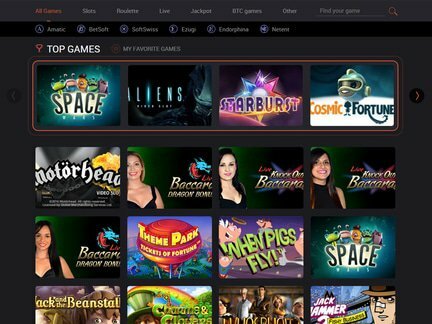 BTC players and players prohibited from playing NetEnt games can play a range of Betsoft slots including Event Horizon, Mr. Vegas, After Night Falls, and more. The wagering requirements for this welcome offer are 40x and all games can be played. There are other promotions available including a 25% reload bonus every Monday, Tuesday, and Wednesday. Players can also enjoy 25 special Martian free spins with the third deposit they make every single day. When you deposit four days in a row, you become eligible for a special loyalty bonus of 15% cash back. These promotions are excellent and give players something to look forward to. When compared with their sister brand, it may not seem as good as they offer 100 free spins with the welcome bonus, but overall, it is a great way to get some risk free gaming. Neither site offers a no deposit bonus. Mars casino is another newcomer for 2016 and whilst players from Canada and France are allowed, there are a number of restricted countries. Players from Bulgaria, Cyprus, Russia, Lithuania, Bulgaria, Ukraine, Slovenia, Latvia, and Denmark are not allowed to open a real player account. Mars Casino uses SoftSwiss's games platform and this means they provide games from a number of other popular software providers too. This includes Betsoft Gaming, Endorphina, Ezugi, NetEnt, Microgaming, and iSoftBet. The casino is available in no download instant play and can be enjoyed on mobile devices too. The lobby is very easy to navigate and players will have no trouble looking through the massive suite of more than 1,000 games. Players can also test out the games using the fun play option that is available without the need to register. Games can also be added to your favorites for easy access. There is a special section called BTC games that includes all the titles that accept bets in bitcoins. Mars casino features a large selection of video slots including popular titles such as Starburst, Aliens, Battlestar Galactica, Mega Moolah, King Cashalot, and more. The table games section includes different variants of roulette and blackjack. There is a video poker section too that includes Deuces Wild, Joker Poker, Tens or Better, Jacks or Better, and more. Specialty games include scratch cards, bingo, and more. The live dealer casino is powered by Ezugi and includes a variety of live roulette and blackjack tables. There no winner's page on the Mars casino website but for those looking for progressive jackpots there are a number of titles. Games with progressive jackpot include Mega Moolah, Tunzamuni, Golden Money Frog, Mega Moolah, King Cashalot, and a few video poker titles. Mega Moolah is a Microgaming progressive jackpot and features the network's largest jackpot pool. It was won in August 2016 with the winning taking home a massive $11,609,942. This progressive jackpot is won on average every 12 weeks. Mars casino was established in 2016 and to date there are no complaints to report. This will be something that we will monitor closely as the site builds in popularity and we will update this section if necessary. Customer support is available 24/7 via live chat and email only. Just click on the help icon on the page to open up the live chat window. The support team is very helpful and friendly. Players will also find a detailed FAQs section on the website too. The Casino is owned and operated by SoftSwiss N.V Casinos and Nabelse Holdings Limited. It is licensed and regulated by the government of Curacao and this is partly due to the fact that not many licensing jurisdictions accept cryptocurrency gaming. Curacao is among the weakest remote jurisdictions and offers little player protection. As far as game safety and fair gaming in concerned, the games a provable fair and can be verified. I found the overall experience at Mars Casino to be quite enjoyable. The choice to play in Canadian dollars or bitcoin was great and registering, depositing, and claiming the Mars casino bonus was a breeze. There was no code required and the free spins were great. The range of games was excellent and I had no problems playing them on PC or mobile. I tested out a number of them on both smartphone and tablet and all worked smoothly. The site is easy to navigate and the fact that you can try out all the games in the fun mode with no registration required is excellent. I would love to see a no deposit bonus being added in the future. Overall, I'd give this brand a rating of 5 out of 5. It's still very new and there are no complaints but for Canadian and French players it's great.